The movie Ted was written and directed by Seth MacFarlane, the creator, writer and main voice actor behind the animated series Family Guy. This series is basically a politically incorrect version of The Simpsons. The latter isn’t afraid to satirize and poke fun at all kinds of topics, but Family Guy fights with the gloves off. It’s more crude, more surreal and less afraid to take taboos and rub them in your face. Kinda like South Park, really. There’s a fairly good chance your gender, orientation and/or ethnicity will be on the receiving end from time to time, so there’s no point in watching it if you can’t laugh at yourself as well as at others. Though the movie Ted is somewhat tame by comparison (no marathon vomiting scenes here), it carries over a lot of familiar elements and doesn’t skim on the absurdity and political incorrectness. There’s a free-flowing “Wouldn’t it be cool if…” vibe to the entire undertaking. The plot: a young boy named John Bennett wishes for his teddy-bear to be his best friend forever, as a falling star passes by. Magic ensues for some reason - and the bear lives! Years later, the boy (now played by Mark Wahlberg) and his toy have grown up to be a couple of immature potheads. Despite this, John has managed to snag a hot, funny and smart girl, played by Mila Kunis (who also happens to do the voice for Family Guy’s Meg). But man-child John is at risk of losing her if he doesn’t put aside childish things. Things like Ted. It’s hard to be absurd and crude and still keep your audience invested in the fate of your characters and the workings of your plot. Ted just about manages it. The story is simple and a bit predictable, but the main joke of a walking, talking and misbehaving teddy-bear doesn’t wear as thin as you would think, because Ted actually has a personality. 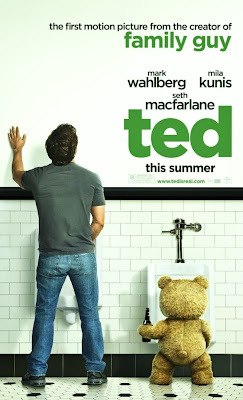 His voice was done by Seth MacFarlane and with typical self-awareness, the movie contains a joke acknowledging that Ted sounds a lot like Peter Griffin from Family Guy (who is also voiced by MacFarlane). Not all of the tangents the movie goes off on hit their mark (I didn’t really connect to its Flash Gordon subplot, I guess you had to be there) and it’s puzzling that near the end, the movie decides to turn from romantic comedy into a tongue-in-cheek thriller for a while, before reverting back. Ultimately the epilogue, featuring a voice-over by Captain Picard, reminds you that the plot didn’t really matter and that anything goes as long as it’s good for laugh. And Ted does indeed have enough of those to make it worth watching, with characters that are likeable enough to make you care. Despite knowing that you should know better.